Looks like Dim's Photobucket went over the limit! should i get started on the small? are there any gameplay concerns that involve graphic changes? DiM, one last GP point. Right now, round 3 nukes is going to be giving wins to the attackers as the castle is only a single territ. You have two tents so it is not a problem for the attackers. Any chance you could even it out by making the castle twice as big and have the 5 from quarter 1 as the castles second 5. Be a shame to lose a game in round 3.
koontz1973 wrote: DiM, one last GP point. Right now, round 3 nukes is going to be giving wins to the attackers as the castle is only a single territ. You have two tents so it is not a problem for the attackers. Any chance you could even it out by making the castle twice as big and have the 5 from quarter 1 as the castles second 5. Be a shame to lose a game in round 3.
fair point. i'll make quarter 2 neutral and make the castle in 2 terits. DiM, right now, red has a way to advance all 5 of his troop sets without tripping over themselves. Blue cannot do this. With the 3 lots of 5 at the back now, they can only get into the fight by one territ (market). This gives the attackers a big advantage when it comes to expanding into there bonus areas. Can you change the arrow between Quarter 1 and market to Q1 and Mill. This will allow blue to move 2 of his 5s into the fight quicker. As for the castles yard, can you make the walls bigger so the territ sits in the yard? Also, call it courtyard. Nice with a map where you only have to plan for one type of game . But it also means it has to be perfect for that type of game! Hopefully we'll see a lot of 1v1 tourneys on this map . I noticed that some arrows cross over the ships territory labels. It looks a little messy. The arrow between Ship 1 and Assault ship 2 could be lowered a bit. The arrow between Base Ship 2 and Supply ship 2 crosses a letter. So does the arrow between Supply ship 1 and 2. If you remove the line where they cross the banner it would look better. Great work DiM. Surprised you have left it this long for the update though. Can we get a stamp for this man so he can do the small. Please. koontz1973 wrote: Great work DiM. Surprised you have left it this long for the update though. i've 99% given up on the foundry. if it weren't for the work i've put in the maps i have active i'd simply bin them and be done with it. I am glad you aren't doing that. The maps you've put out or are working on recently are by far my favorite maps of yours! And are literally head and shoulders above the other map makers in style, graphics and gameplay. Just noticed that on the map it says the sully is doing the xml. Do you think he could find the time for it as will as the other one? Happy to do it for you if you want it done faster. koontz1973 wrote: Just noticed that on the map it says the sully is doing the xml. Do you think he could find the time for it as will as the other one? Happy to do it for you if you want it done faster. i've already told him to get started on it to avoid the knights and warlocks situation. he said he got it covered cause this one is apparently very easy compared to the other one. So we should get to play this one sometime in the year 2046 then. any chance of a gameplay stamp? Dim wrote: no map maker will make a 2000*2000 px map if he can fit it in 500*500, at most he'll take an extra 5-10% for fitting some nice graphics. when he goes overboard he'll most likely be told by other map makers and he'll have to optimize space usage. and ultimately every map maker will want to make every little bit of space count and avoid unnecessary super-sizing because a huge map with lots of dead space will be unpopular and no mapmaker wants to be the author of an unpopular map. I think at 800x800 for the small map, there is a lot of wasted space especially at the left side; which with a bit of re-organisation could reduce the size of this map overall considerably. I will say that Bay Tower cannon have very large firing range also that could help reduce size. this has already been debated at length. yes i could cram those ships closer yes i could make the attacking army squished to take up less space and i could even cut the town down to a smaller size. but then it won't look like the siege of a mighty fortress. plus i have the legend that takes a lot of space and can't really be reduced any further without losing a lot of the readability. what? there are clear arrows going back and forth to indicate connections. Mmmm, I wonder how much you have really tried...i am sure there is some space in there somewhere that would still make it look excellent. Nothing seems top have changed much size wise since V5. it's a graphic thing Dim. no bridges...are they deploying pontoons which probably weren't around then? isaiah40 wrote: it looks like the bonuses are good, things look pretty much balanced. That said, I'll get Ian to look this over. this was over 2 months ago. any chance somebody will actually look over it? and while the gameplay CA is at it can he bring over a graphics CA cause frankly waiting for another 2-3 more months before a graphics CA comes is kinda annoying. can i get a gameplay badge? DiM, I will take a look at it tomorrow. A preliminary issue I see is shouldn't the balloon be able to attack both the Yard and the Castle? 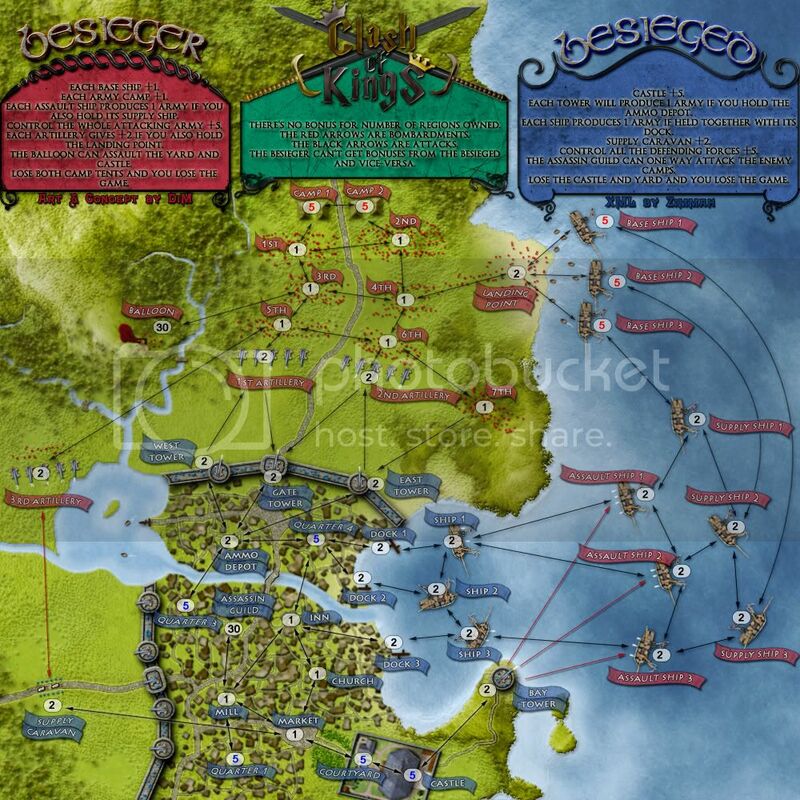 If both Base Camps can be attacked by the assassin, or did you want to make it slightly different for the Besieger? I will take a much closer look tomorrow and get with ian about it. Sorry for the delay. nolefan5311 wrote: DiM, I will take a look at it tomorrow. A preliminary issue I see is shouldn't the balloon be able to attack both the Yard and the Castle? If both Base Camps can be attacked by the assassin, or did you want to make it slightly different for the Besieger? I will take a much closer look tomorrow and get with ian about it. Sorry for the delay. it attacks both the yard and the castle. i just forgot to update the legend when i added the yard.